Have you longed for, dreamed of, or wished for more prosperity in your life? Maybe you’ve wanted more money, new clients or better health. Or, perhaps, you’ve been looking for that perfect partner or more fulfilling relationships. Regardless of the nature of your search, it all comes down to wanting to have a more joyful life experience. We call that experience prosperity. Prosperity isn’t something that’s available to just a few people. It’s available to everyone and it’s available right now. 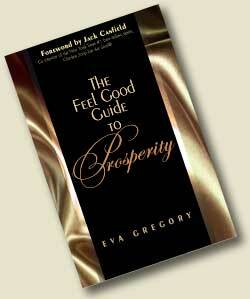 As Eva Gregory clearly shows in her book, anyone, regardless of his or her current situation, can practice these principles and become more prosperous. In The Feel Good Guide to Prosperity, you will be shown simple explanations and numerous examples of exactly how you can apply these principles in your own life, regardless of your current situation.